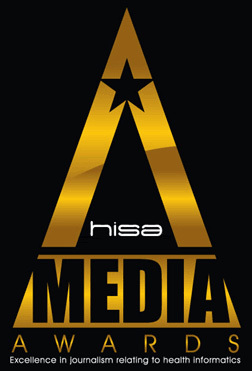 Members are invited to nominate individuals for the 2015 HISA Media Awards. The HISA Media Award is for excellence in reporting in Australia on healthcare transformed and sustained by information and technology. Nominated individuals may be working through print, radio, television, social media or online media in Australia and be authors, bloggers and/or editors. A selection of media working in the digital health community can be seen HERE. The award will be presented to an Australian professional media or communications person who HISA believes has made a significant contribution to a better understanding of health transformation through information and technology in Australia. Nominations close Monday 6 July. The report must have been published between 1 July 2014 and 30 June 2015. Last year’s award was presented to journalist Dallas Bastian from Nursing Review magazine. The winner is announced and the award presented at the HIC gala dinner. The HISA Media Award 2015 is proudly supported by Australasian Medical Writers Association (AMWA). Visit the Awards page HERE.